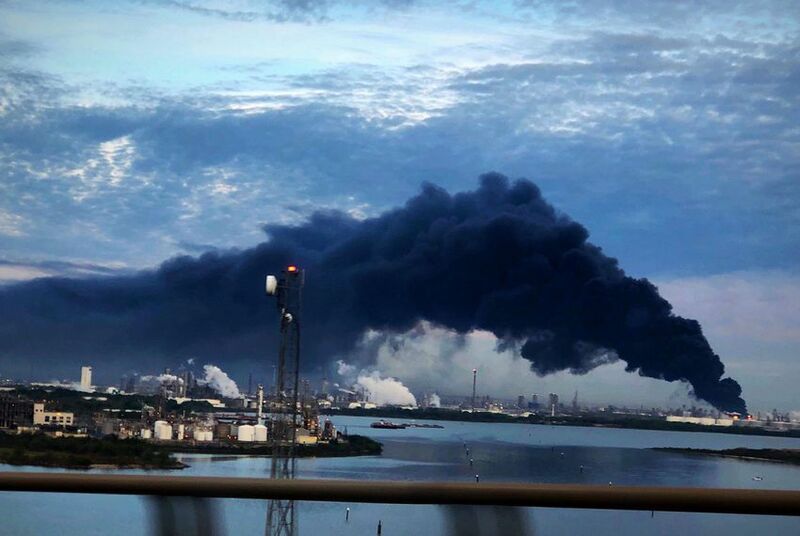 Late last month as crews worked to contain a roaring fire at a Houston-area petrochemical storage facility, the state of Texas did something unheard of, at least in recent memory: It sued the company that operates the site before the blaze was fully extinguished. It did the same thing again this week — the same day a chemical fire broke out at another Houston-area plant. “Polluters will be punished,” Gov. Greg Abbott tweeted on March 22 after Texas Attorney General Ken Paxton — Abbott's successor — announced he had filed suit against Intercontinental Terminals Company, alleging violations of state environmental laws. In a statement that day, Paxton said the state "works hard to maintain good air quality and will hold ITC accountable for the damage it has done to our environment." He also noted that ITC "has a history of environmental violations." Less than two weeks later, Paxton's office on Tuesday sued chemical manufacturer KMCO the same day a fire broke out at its plant in Crosby, killing one worker and critically injuring several others. Paxton's decision to swiftly file suit over both incidents is a significant departure from the state's past approach to environmental enforcement. For one, the state often doesn't sue over such incidents — even bigger, more deadly ones like the 2013 explosion at a fertilizer plant in the Central Texas town of West that killed 15 people, including 12 first responders, and injured 200 (The year after that incident, then-Attorney General Abbott issued a ruling that made it more difficult for the public to know what hazardous chemicals are housed in such facilities). After a 2005 explosion at BP's Texas City refinery killed 15 workers and injured 180, Texas filed suit against the company years later — and only after the federal government had hit the company with tens of millions of dollars in fines. The state was similarly slow to sue BP after a fire and explosion at its Deepwater Horizon offshore oil rig in 2010 killed 11 workers and resulted in what is believed to be the largest marine oil spill in history. Abbott took the company to court three years later after five other Gulf Coast states and a bevy of local communities had already sued. In 2015, Harris and Fort Bend counties — to Paxton's apparent chagrin — beat the state to the punch in suing Volkswagen after the German automaker's admitted use of software that allowed its vehicles to circumvent emissions limits. And after explosions at another Houston-area chemical plant during Hurricane Harvey, Harris County almost immediately filed a lawsuit against the owner of the facility, Arkema Inc. The state joined the lawsuit months later. It is still pending. For environmental groups that have long asked the state to crack down on rogue industrial polluters — and who closely track its handling of such incidents — Paxton's swift legal action against ITC and KMCO was a welcome surprise. “I have not found anybody who remembers an instance like this,” said Adrian Shelley, the director of the Texas office of Public Citizen and the former longtime head of the Air Alliance Houston. Paxton's office referred questions about the lawsuits to the Texas Commission on Environmental Quality, the state's environmental enforcement agency, which referred the cases to Paxton. An agency spokesperson said in statement that it "has consistently exercised its enforcement authority to protect public health and the environment by referring companies to the Office of the Attorney General for civil enforcement." "TCEQ will continue to hold bad actors accountable for violations of environmental laws," the statement said. Indeed, TCEQ's annual state enforcement reports indicate that the agency refers a few dozen civil cases to the attorney general's office every year that result in tens of millions of dollars in fines, usually after failed attempts to get a company to comply with state laws through administrative enforcement action. Environmental regulators in Republican-led Texas have long been up front that their approach to environmental enforcement is less about financial or legal punishment and more about coaxing industry into compliance with state and federal regulations. State records show that the most common approach to environmental enforcement is through a far less transparent administrative process, where companies often negotiate lower fines that are handed down through enforcement orders months or even years later. And Paxton and Abbott have made more headlines going after environmental regulators than environmental offenders, filing dozens of lawsuits against the Obama-era U.S. Environmental Protection Agency. So the sudden change in the state's enforcement approach also has raised suspicions. On Wednesday, the progressive group Lone Star Project sent out a news release that accused Paxton of having ulterior motives — even going so far as to call him "Chemical Ken" — claiming that his swift action was fueled by a desire to preempt local environmental prosecutors, who the group argues would pursue larger penalties against the companies — and would receive a cut of those penalties if they won in court. "Paxton can now act as a 'friendly plaintiff' who is only technically in opposition to the companies," the release said. "He can agree to a settlement with a relatively small fine and little or no safety reforms." The Harris County Attorney's office has long employed a team of aggressive environmental prosecutors, who filed their own suits against ITC and KMCO shortly after the state did. Whether the state lawsuits will override Harris County’s isn't clear, said Rock Owens, the county's chief environmental prosecutor. But if Paxton does attempt to preempt Harris County’s lawsuit, “we intend to challenge him," he said. Owens said the county is often motivated to sue companies because it knows the state won't take the lead. Since at least 2013, state Republican lawmakers have — with mixed results — repeatedly pushed legislation that would limit the ability of Harris County and other local governments to sue over environmental offenses. This session, a bill proposed by state Rep. Greg Bonnen, the brother of House Speaker Dennis Bonnen, would require Paxton to sign off when counties and cities want to hire outside lawyers for environmental cases and allow him to reject those arrangements if his office is already pursuing similar legal action. Owens said using outside lawyers has been a key tool for his team over the years in major environmental cases — they typically do not get paid unless they win, which can save taxpayer dollars. Neil Carman of the Lone Star Chapter of the Sierra Club, who worked for a dozen years as an enforcement inspector for TCEQ’s predecessor agency, said he believes the timing of Paxton's lawsuits has less to do with Harris County and more to do with pressure from state lawmakers — who held hearings this week on the ITC fire — and national media coverage of the incident, which sent a dramatic black plume of smoke billowing over the state's largest city. Carman also said lawsuits are low-hanging fruit for the state because they involve relatively unknown companies that don't have the political clout of the bigger players in the industry. "ITC is not ExxonMobil or Shell Oil," he said. "TCEQ wants to show it's aggressive in enforcement when it's not."